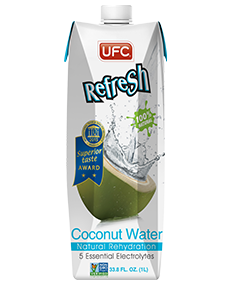 UFC Refresh Coconut Water is 100% natural, produced from carefully selected fresh coconuts harvested from Thailand’s “coconut belt” areas where the best coconuts are cultivated. With no added sugar and no preservatives, UFC Refresh 100% Coconut Water is awarded 2 golden stars at the iTQi Superior Taste Award 2015. UFC Refresh Coconut Water is filled with essential electrolytes and various nutrients, making it a healthier choice for natural rehydration. UFC Refresh Coconut Water is available in America, North America, Europe, Australia, New Zealand, Asia, South East Asia, Middle East and many other countries.